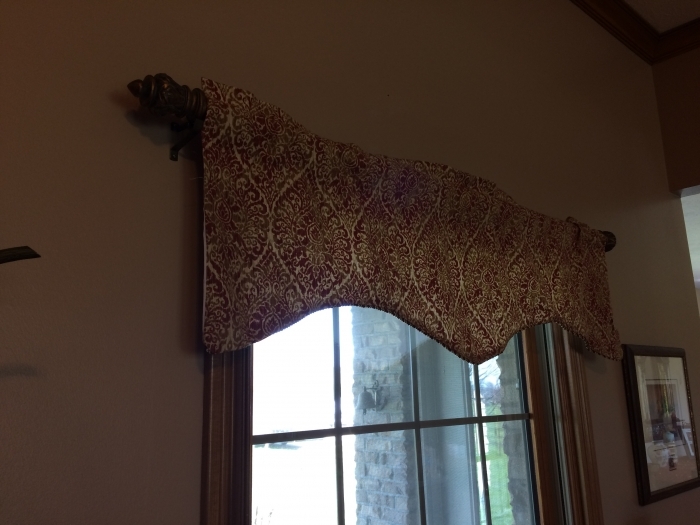 Lola is a high-end lined, scalloped & corded valance. Large scale unique pattern, accented with quality rope cording, available in 3 great colors. The valance has a 3" pocket & a 1" header. For proper fullness, use approx two times your window width in fabric. For wider windows use multiple valances. Also can be installed as flat valance on a single window. 55% Linen/45% Rayon, machine washable. The colors are very muted and not too busy. Many complements and the price amazing. I love them. They are lined with white fabric and the trim makes them look more expensive than they were! I have made curtains and these are worth the purchase! Quick, easy service, items received quickly. Very happy with the quality and price of the swags. Very positive experience. WiIl look here first for any other curtain needs. Love the material and the color. Very "rich" looking. Lining doesn't exactly match up with curtain material but I was able to make them work. 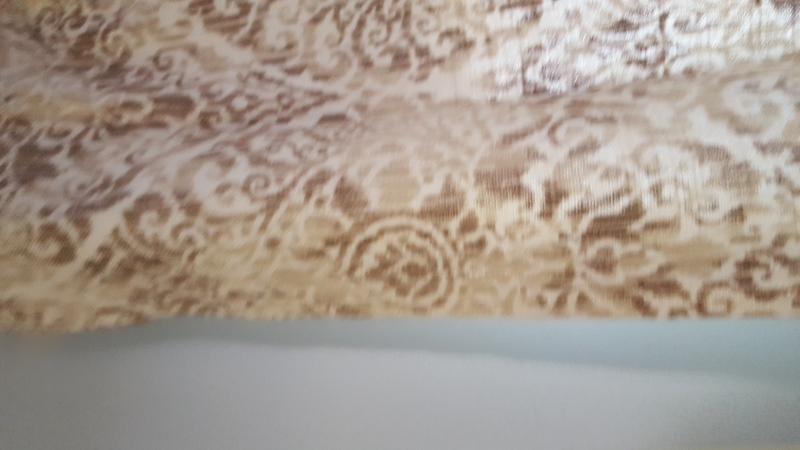 One of the ten valances that I ordered was not a color match to the rest. 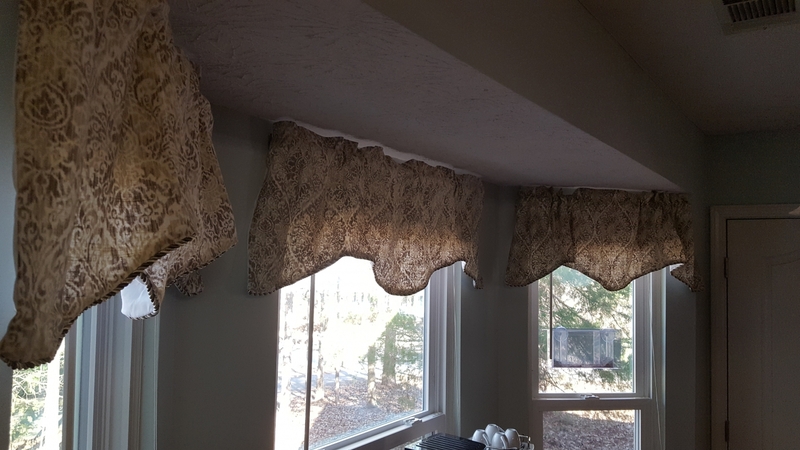 Swags Galore was more than helpful in sending me another valance that was a perfect match. Everything arrived in a very timely manner and was well packaged. 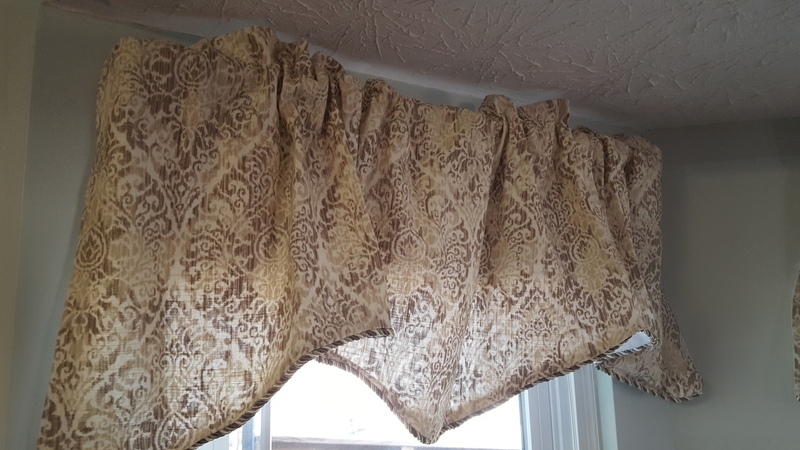 I purchased 6 of these valances. they were shipped promptly..
ProsNice fabric, lined, finished with coordinating cording. ConsA couple of the valances were missing stitching in a couple of places. good quality. need two per window. I love the valance. It looks great in my master bathroom. They are lined and have a very pretty trim. More beautifu than photo! Nice lined material, they were a great find! I ordered 8 valances for my kitchen. They exceded my expectations and look even better than the picture. The material is very nice with a thick lining and rope along edge. Very, very nice quality. I'm so glad I chose these!! I get so many compliments on them. Nice color, made well especially for the money. I love the product! It exceeded my expectations. Overall product quality and interaction with the company was very positive. The valances have worked out well. The color is as shown in the picture, and the valances are nicely lined. After months of searching for kitchen valences and being disappointed with all the options out there, I found this website. Not only did I love the pattern and color, I loved the price. The customer service was also top notch. The quality of my valences was better than I had imagined. Me and my husband are so pleased with our purchase. ProsGood quality and prompt delivery. ConsWish there was free shipping after spending a certain amount. I didn't get that with my purchase. Items were good quality and arrived quickly. Package arrived very quickly. Valance is very nicely made, color as in the picture (Greens). Perfect for our bedroom with long sheers at the sides.